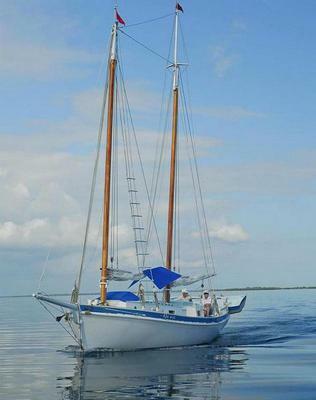 “Chance Along” is a 33 ft. Culler-designed wooden schooner, owner built, launched 1988 and lived aboard. Built from Caribbean pine over steam bent cabbage bark frames. Then the cradle moved by hand winch over pipe rollers 'til she floated. She has a shapely hull leaving little wake.